From something totally traditional to modern, stylish designs, our joiners will work around your needs and ideas. Experts in all aspects of joinery, our team strive to provide first class pieces that you can be proud to place in your domestic or commercial property. Contact our professional joiners today, in Barnsley, South Yorkshire, to find out how our joinery company can help you. to have our joiners produce high-quality work for your home or business. A home or business that boasts style and sophistication is easily obtained when you choose our highly regarded joinery company. 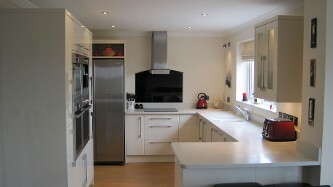 Based in Barnsley, South Yorkshire, A Class Joinery is renowned for carrying out professional, cost-effective services. Drawing upon our 25 years of experience, our joiners work tirelessly to deliver high quality services. Whether it's your kitchen, bedroom, bathroom or fencing and decking that needs revamping, we're ready to assist you. No matter what project you need tackling, we're here to get it done. We offer friendly, expert advice so you can rest assured knowing that you're making the right decision. Friday, 8:00 a.m. - 6:00 p.m.